Hi friends! I hope its a happy Friday for you. 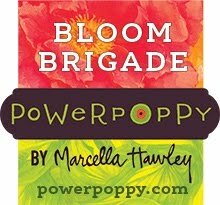 We have been in the deep freeze here so my heart is getting a bit of a longing for spring to come. 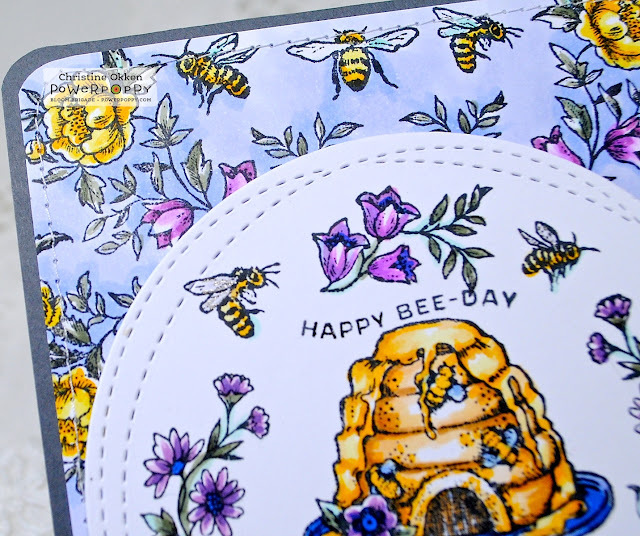 We’re no where near that, but I can dream with today’s card made with Power Poppy’s set Bee Kind Toile. It’s such a magical and elegant set, where everything your little heart desires related to bees and to toile is packed in its mega size. 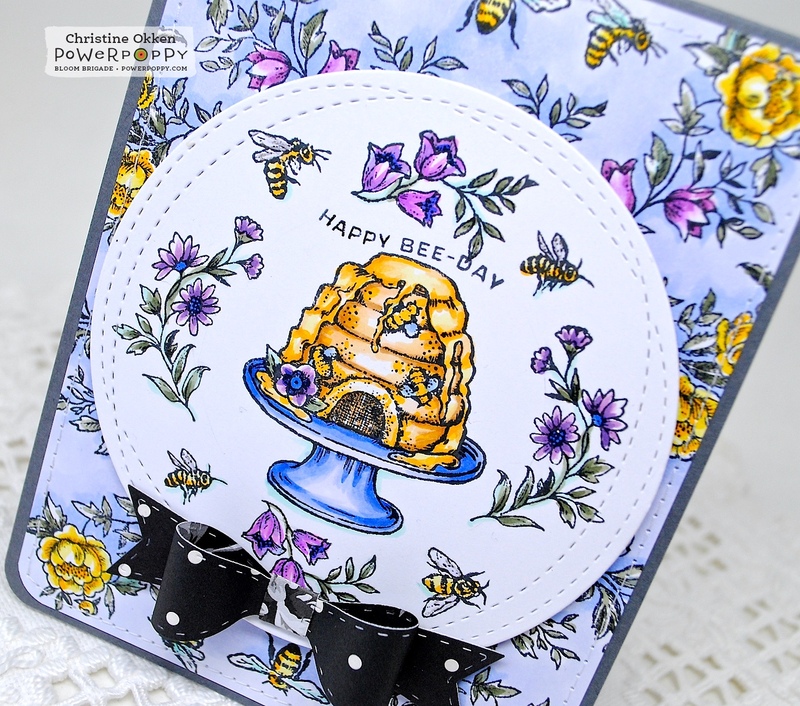 I created the focal piece with the honey cake included in the set, surrounded by some of the small toile and bee elements and coloured it up with Copics. I die cut it with a stitched die that mimics a bit of a bee’s flight path. For the background I stamped a toile pattern and then coloured it up to match the main image, adding in a bit of B60 and B63 for softeness and contrast from the main image. It’s such a pretty background - it was almost a shame to cover it up! Because the whole card is quite busy with all of the pattern, I decided to accent it simply with this lovely bow cut from a TCP bow CutUps die. There’s a little sparkle on the bee’s wings that you can probably catch in the top left of the main image. Happy BEE day to you! 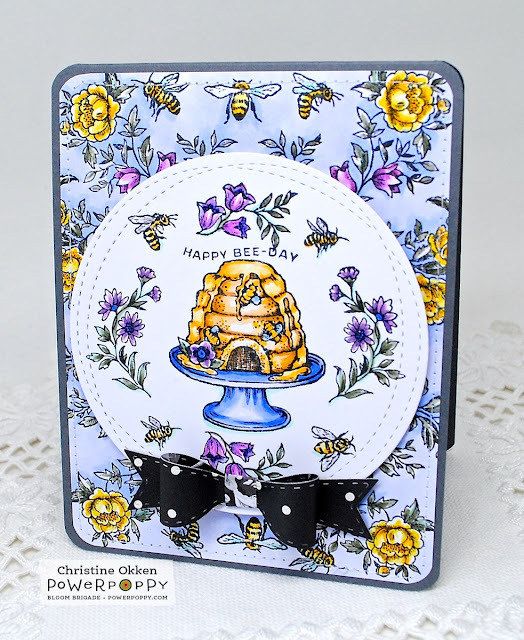 Christine, this is so sweet and endearing...love all your color choices including that soft blue background! This is one of my favorite sets...and you’ve inspired me to color it again! Thank you so much for sharing your heart here and your kind comment to me with the scripture. Scripture is always appropriate for every occasion and perfect for edifying. Thank you. I see a thumbnail in my Feedly and instantly recognize it as yours before I even see your name. Such beautiful coloring and so much of it! I love this set. You're right... it's packed full of gorgeousness. I can't believe that you stamped & colored that background!!! I thought it was premade dsp. ABSOLUTELY GORGEOUS!! Christine this is beautiful and so sweet. The colors are vibrant and oh I do like how you created a scene with these stamps. So awesome Christine, I love those little bees and the black bow as your finishing tought. Thank you for sharing and also a happy BEE day to you.